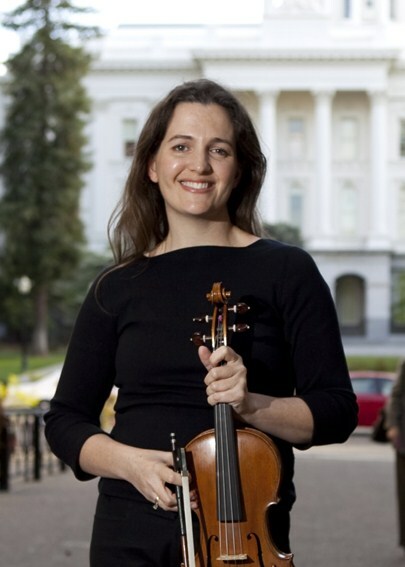 Classically-trained violinist Ingrid Peters is a Sacramento-based multi-talented instrumentalist and singer, who has built an impressive career in over twenty years as a highly-sought-after performer, composer and music educator. Ingrid has been a member of the Sacramento Philharmonic & Opera since 2000 and the Sacramento Choral Society and Orchestra. Known for her passionate and soulful live performances, Ingrid’s versatility ranges from her work with the jazz ensemble Veranda Swing and the Celtic group, Cahersiveen, to her richly-layered bluesy folk infusion with the band Proxy Moon. The heart of Ingrid’s musical interpretations is that unique blend of technical mastery and an improvisatory emotional connectedness to her audience that is undeniably intoxicating. While typically performing violin, Ingrid’s lead vocal work (she often sings in French) is an intimate experience that conjures up references to Norah Jones. The extension of her ability to inspire people is evident in her 25 year career as a music educator. She has taught countless young violinists from introductory level to concert-level performers. Most recently, Ingrid is the founder and director of Sacramento Institute for Music and the Arts (SIMA), A non-profit organization whose primary mission is to make music more accessible to the region’s youth, SIMA provides low-cost after school music classes and performance opportunities for a broad range of public school children. With an established curricula that draws upon her experience as an educator and performer, Ingrid has assembled a group of talented music instructors and administrators to implement the K-12 program, MusicLIVE. MusicLIVE is currently being held in several area schools, and providing a foundational string and choral education to over 500 students.